v16.2 introduces new MS Excel-inspired column filter popups which make creating filter criteria easier. The first tab allows you to select from among all available values. The second tab allows you to create a filter expression using a set of filter operators (Equals, Between, Contains, etc.). Deliver elegant, touch-enabled applications on Windows - the platform you know and love. The eXpressApp Framework is a multi-platform application framework that creates powerful line-of-business applications that target Windows, the Web and Mobile. Write code at the speed of thought, automate testing, visually debug and refactor with CodeRush for Visual Studio. Easy-to-use and always interactive data visualization Dashboard for Windows, the Web and mobile devices. A non-visual .NET Library that allows you and your team to process Excel, Word, and PDF documents without using Microsoft Office automation. TestCafe Studio delivers functional web application testing on Windows, MacOS, and Linux. 100% native iOS and Android controls and Xamarin wrappers for use in Visual Studio, Xcode's Objective C or Swift projects, and Android Studio. A rich collection of icons and images created by our design team. (includes all DevExpress .NET products in one integrated suite) Our Universal Subscription is a comprehensive and feature-complete software development toolset for .NET developers. It includes all DevExpress .NET Controls, HTML JS Technologies, Dashboard and Report Server in one integrated package. When only the best will do. (includes all DevExpress .NET Controls along with CodeRush) DXperience Enterprise is a feature-complete software development toolset for .NET developers. It includes all DevExpress Controls for WinForms, WPF, ASP.NET, Silverlight and Windows 8 plus the award-winning Visual Studio Add-In CodeRush, in one integrated package. WinForms With over 120 optimized controls and libraries, the DevExpress WinForms Subscription helps you deliver compelling, easy-to-use business solutions fast. Emulate the look, feel and capabilities of Microsoft Office or replicate the dock based UI of Visual Studio or Adobe Photoshop and take your WinForms applications to an entirely new level with familiar features end-users have come to rely upon. It's everything you need to build your best in one integrated suite. WPF With over 110 controls, the DevExpress WPF Subscription will help you deliver high-performance line-of-business applications that meet and exceed the needs of your enterprise. VCL Create elegant user experiences, deliver high-impact line of business solutions, and leverage your existing VCL skillset to build next-generation applications for tomorrow. UWP (Windows 10) Elegant, Easy-to-Use, Touch-First UWP Controls. Build Your Best without Limits of Compromise. Desktop Reporting DevExpress Reports is a feature-complete reporting platform for the .NET Framework. Its ships with an easy-to-use Visual Studio report designer and a rich set of report controls, including pivot tables and charts so you can construct reports of unmatched elegance and informational clarity. ASP.NET WebForms With over 100 UI controls for WebForms (including Reporting) you will deliver high-performance line-of-business applications that meet and exceed the needs of your enterprise. ASP.NET MVC & Core Server-side MVC extensions or client-side controls with ASP.NET Core support - DevExpress offers you two parallel product lines, both shipping with everything you need to build Office-inspired applications - Data Grids, Schedulers, Charts, Pivot Grids, Navigation & Layout, and much more. Bootstrap WebForms Extend your site's audience reach and boost search rankings by leveraging lightweight render, responsive layout, and modern performance-optimization techniques. Rendered code uses Bootstrap CSS components exclusively, meaning that all controls will adjust to any screen resolution. Web Reporting DevExpress Reports is a feature-complete reporting platform for the .NET Framework. Its ships with an easy-to-use Visual Studio report designer and a rich set of report controls, including pivot tables and charts so you can construct reports of unmatched elegance and informational clarity. Dashboard Create and distribute royalty-free decision support systems and effortlessly share business intelligence across your entire enterprise. Whether targeting the desktop, the web or mobile devices, DevExpress Dashboard will help you go from zero to dashboard in record time. Report & Dashboard Server The Enterprise-ready DevExpress Report and Dashboard Server provides straightforward setup, intuitive administration and comprehensive report distribution options for individuals within and outside your enterprise. Office File API Read, write and print XLS, PDF, DOC and RTF files. Convert documents to a different format. Password-protect documents, generate barcodes and compressed archives. Native UI Controls These 100% native controls for iOS and Android have been designed to be used in Xcode's Objective C or Swift projects and within Android Studio. For those favoring C# or VB.NET, Xamarin.iOS and Xamarin.Android wrappers are available for use within Visual Studio. XAF – App Framework When time to market matters and you need to deliver functional and easy-to-use business solutions that target both WinForms and ASP.NET, look no further than the award-winning eXpressApp Framework™ (XAF). XPO – ORM Library eXpress Persistent Objects (XPO) is an Object-Relational Mapping (ORM) tool that handles all aspects of database creation and object persistence, allowing you to concentrate on your application's business logic rather than database complexities. It offers Code First, Model First and Database First development workflows. CodeRush for Visual Studio Write code with CodeRush for Visual Studio at the speed of thought. Logify – 24/7 App Monitoring Real-Time application monitoring so you can analyze and improve your apps and deliver rock-solid solutions that behave as expected across all usage scenarios. TestCafe TestCafé is different by design. We've created a new way to communicate with websites - one that offers much more flexibility. No more browser plugins, no external test recorders, no browser version dependencies, no object wrappers or complex APIs, no proprietary made-up script languages and inability to use your machine while testing. You can now add an individual title for each pane and hide a pane by clicking its title. Panes can be displayed using a grid layout. Our WinForms Chart Control now supports nested Series Templates - allowing you to implement drill-down enabled charts with ease. You can create endless drill-down levels and use the control's integrated Breadcrumb navigation option to move across your data hierarchy. Our WinForms and WPF Chart controls now support keyboard navigation. New settings allow you to configure hotkeys. Hotkeys can also be used to affect the behavior of mouse buttons when zooming in/out or zooming to a rectangle. With this release, end-users can zoom a specific axis element using the mouse wheel when the mouse pointer hovers over an axis label (see the animation below). The Chart Control's Crosshair Cursor can now display Technical Indicators. We've also extended the Indicator's API and made it similar to the Series API. All settings available for a series are now available for an indicator. The Grid's Find Panel ships with a new Search mode. When used, search results are highlighted within the view and scrollbar. record changes and custom data. With the DevExpress WPF Subscription, you can create highly interactive XAML based applications that address customer needs today and build next generation touch enabled solutions for tomorrow. Whether it's an Office inspired application or a data centric business intelligence solution, it's all possible with feature-complete DevExpress WPF Controls. Supercharge the Visual Studio IDE and eliminate duplicate code and improve code quality. Write code faster, navigate more efficiently, run tests, find and fix defects faster. CodeRush. When productivity matters. Note: Source code is not included for CodeRush. A robust and all-inclusive development toolset designed to address the needs of developers targeting the WinForms platform. Whether building Office Inspired or data centric Business Intelligence Applications, you are always in full control with the DevExpress WinForms Product Line. Whether targeting ASP.NET AJAX or ASP.NET MVC, the controls and extensions that ship as part of the DevExpress ASP.NET Subscription, can help you create engaging, interactive and touch-enabled web experiences that emulate the look, feel and capabilities of today's most popular web applications and maintain the highest performance standards regardless of the demands placed upon your web application by your end-users. Whether creating a business intelligence platform or building Office-inspired solutions for productivity and collaboration, the DevExpress Silverlight Subscription offers innovative, elegant controls engineered to help your applications stand above the rest. The new DevExpress Windows® 8 XAML Subscription helps you create compelling business solutions that exploit the best parts of Windows® 8 when targeting next generation devices such as Microsoft Surface. The eXpressApp Framework (XAF) is a flexible application framework and allows you to create powerful line-of-business applications for Windows and the Web (Intranet). Seamless integration of award-winning DevExpress presentation controls and data access libraries means you can build feature-rich and highly interactive Office inspired applications for both WinForms and ASP.NET. eXpress Persistent Objects (XPO) is a powerful bridge between the true object world and relational databases. It offers Code First, Model First and Database First development workflows. XPO is an Object-Relational Mapping (ORM) tool that handles all aspects of database creation and object persistence, allowing you to concentrate on your application's business logic rather than database complexities. Snap is a Microsoft Word® inspired WinForms reporting platform, designed to simplify the way in which you and your end users generate business reports. Snap leverages the intuitive nature of a word processor and integrates the power of a banded report designer into one. WinForms reporting will never be the same again. The DevExpress Report Server was engineered for the enterprise and made to reduce pressures on development teams by empowering users to directly generate and manage reports. The Report Server offers straightforward user management and role definition so you retain control where needed. It includes insightful data management capabilities in order to maximize productivity and minimize grunt work. Analytics Dashboard Easy-to-use and elegantly interactive data visualization Dashboard for Windows, the Web and Mobile devices. DevExpress Dashboard helps you deliver solutions that allow any enterprise to visually explore business trends using stunning performance indicators. Document Server The DevExpress Document Server is a non-visual .NET Library, built and optimized for C#, VB.NET and ASP.NET developers alike. It allows you and your team to fully automate Excel and Word without using Microsoft Office automation. Generate XLS, XLSx, DOC, DOCx, RTF, CSV and Snap Report files using a straightforward API that's easy-to-use and ready for the enterprise. TestCafé delivers functional testing for websites across multiple operating systems - from Windows and MacOS to Linux. Its revolutionary architecture allows you to run tests in all modern browsers and on remote devices such as smartphones and tablets. With TestCafé, you'll be able to run tests within multiple browsers in parallel, debug your tests using browser debuggers, use it in Continuous Integration systems, and so much more. CodedUI for WinForms Coded UI from Microsoft is a solid testing framework with tight integration across a broad range of Microsoft technologies, including Visual Studio and Test Manager. Unlike many vendors claiming support for Coded UI through the simple use of MSAA, we went the extra mile to make certain that our controls fully comply with Microsoft's testing framework. We don't simply support Coded UI; we support it to the maximum extent possible. Your Universal Suite Includes priority technical support from our knowledgeable technical support-engineers. It doesn't get any better than this - priority support services directly from our subject matter experts. You deserve answers fast & DevExpress Technical Support Reps will resolve your issues quickly and accurately. DevExpress ASP.NET AJAX Controls and MVC Extensions are powered by a patent-pending server-side data processing engine so that regardless of dataset size, users can shape and analyze mission critical information at lightning speed. Performance is further optimized with Controls and Extensions that use memory efficiently, without the loss of functionality or high-impact, high-value features. A comprehensive set of optimizations such as HTML compression, AJAX callbacks, image sprites, resource caching and sharing means your web application will behave as expected, each and every time. With over 80 optimized controls and libraries, the DevExpress WPF Subscription, can help you create powerful business solutions that maintain the highest performance standards regardless of the demands placed upon your application by your end-users. The DevExpress WPF Subscription is powered by a patent-pending server-side data processing engine so that regardless of dataset size, users can shape and analyze information at lightning speeds, never sacrificing features or capabilities. From large financial trading applications using real-time feeds to information driven enterprise-grade business intelligence solutions, our tools will deliver the scale and performance your business requires from day one. DevExpress Silverlight With over 75 optimized controls and libraries, the DevExpress Silverlight Subscription, can help you create compelling business solutions that emulate the look, feel and capabilities of Microsoft Office® and maintain the highest performance standards regardless of the demands placed upon your application by end-users. -Faster XAML loading thanks to pre-compilation to a binary format. -A new PDF Viewer Control with full support for touch gestures, printing and multiple page view styles. 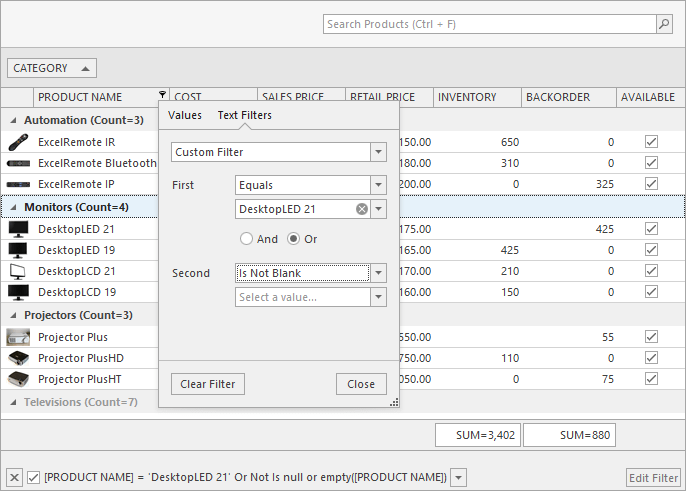 -Microsoft Excel style Data Filtering UI and horizontal virtualization support in Grid Control. -New Tile Control type that support newer sizing options and animations to match those introduced in Windows 8.1 RTM. DevExpress Reporting The key to amazing reports is to empower users and to provide them tools that facilitate consumption and understanding. At a single glance, the information presented within the report must be visually compelling and built so that knowledge leads to actionable insights for the enterprise. An overly complex visual layout, excess noise and irrelevant data fundamentally impacts the effectiveness of the report and worse, leads to confusion and incorrect conclusions. The DevExpress Reports Subscription allows you to clearly communicate cause and effect and demonstrate the impact of individual decisions within your enterprise for all major Microsoft .NET Framework platforms, including WinForms, ASP.NET, WPF and Silverlight. DevExpress Document Server The DevExpress Document Server is a non-visual .NET Library, built and optimized for C#, VB.NET and ASP.NET developers alike. It allows you and your team to fully automate Excel and Word without using Microsoft Office automation. Generate XLS, XLSx, DOC, DOCx, RTF, CSV and Snap Report files using a straightforward API that's easy-to-use and ready for the enterprise. DevExpress Report Server Engineered as a turnkey solution, the DevExpress Report Server includes a fully integrated Report Server and Client that provides straightforward setup, intuitive administration and comprehensive report distribution options for individuals within and outside your enterprise. The DevExpress Report Server won't break your IT budget. You can purchase it with 15 Client Access Licenses. DevExpress Analytics Dashboard The DevExpress Dashboard ships as part of the Universal Subscription. CodeRush CodeRush makes it easier to see what's going on with complex code, so you can move forward and spend less time wandering and wondering. Why is that expression's value different from what you expect? When did that local change? How many times have we been through this loop? CodeRush's compelling new debug visualizer effortlessly and instantly answers these questions and more. DevExpress eXpressApp Framework eXpressApp Framework ships as part of the Universal Subscription. TestCafé TestCafé is different by design. We've created a new way to communicate with websites - one that offers much more flexibility. No more browser plugins, no external test recorders, no browser version dependencies, no object wrappers or complex APIs, no proprietary made-up script languages and inability to use your machine while testing. DevExpress VCL The DevExpress VCL product line allows you to create applications that emulate the touch-first experience that lies at the heart of Windows 8, without abandoning your existing VCL investments.